It’s that time of year when party food has its moment or several moments. I have to say, as I was preparing the dish shown here today, I kept thinking of how well it would work as a hors d’oeuvre for a party. This dish came from Mark Bittman's Kitchen Matrix , and I received a review copy. The idea behind the book is that every basic recipe can be adapted into sometimes countless variations. General concepts like chicken wings, vegetable soup, grain salads, deviled eggs, etc. are shown with simple changes that take each in numerous different directions. The cooking technique remains the same, but the flavor profiles change. So, those wings could end up with typical Buffalo spicing, or you could choose teriyaki, lemon-garlic-pepper, chipotle-lime, Thai peanut, or jerk. The book would be a great source for those times when you’ve run out of ideas for what to do with fresh corn or zucchini or beets. Of the 16 ways celery is used, there are a few I would never have thought of. Celery slaw with fennel, celery raita, and orange and celery salad all sound delicious. There's a very practical feel to the book. It straightforwardly guides you through the options for choosing a flavor profile and combination of ingredients. Because this is a Mark Bittman book, of course there are gentle reminders that I like seeing about minimizing meat intake and filling most of our plates with vegetables. And, the book ends with a delightful chapter of sweets with twists on basic cookie dough, four versions of doughnuts, and a dozen options for ice pops. The first recipe I tried from the book was the Corn Cakes with fresh corn kernels. I served those savory, little pancakes for brunch with frittata and topped them with a sprinkling of smoked paprika. The other options for the corn cakes included turning them into arepas or corn and crab cakes. 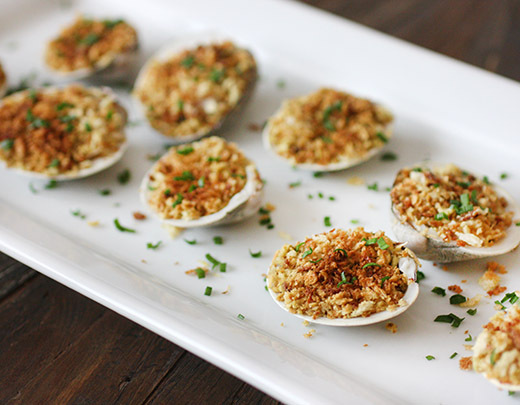 Next, I had to try the Baked Clams with Wasabi Bread Crumbs. One reason this dish would be great for a party is because the clams can be steamed open and prepped in advance and kept in the refrigerator. They can be popped into a hot oven for a brief 10 minutes to warm through just before serving. So, to begin, I always clean clams by putting them in a big bowl of water and adding a few tablespoons of flour. I leave them to soak and purge for 15 minutes or so. Then, I rinse the clams to remove any flour, and they’re ready to steam. To steam, I put them in a Dutch oven, add some water and white wine to total about one-half cup, maybe add a peeled and smashed garlic clove or two, cover, and bring to a boil. Check the clams after a few minutes and remove each one as it opens. Once cool enough to handle, the top of each shell was removed. If serving at a party, I would loosen the clams from the bottom shells at this point to make eating them even easier. They could be refrigerated until ready to serve. For the bread crumb filling, I toasted the panko in a dry skillet on top of the stove first. This wasn’t called for in the recipe, but the bread crumbs will have a better chance of a good overall toasting if given this head start. While toasting, a teaspoon of soy sauce and a small drizzle of sesame oil were added. After toasting, a teaspoon of wasabi powder was stirred into the bread crumbs. 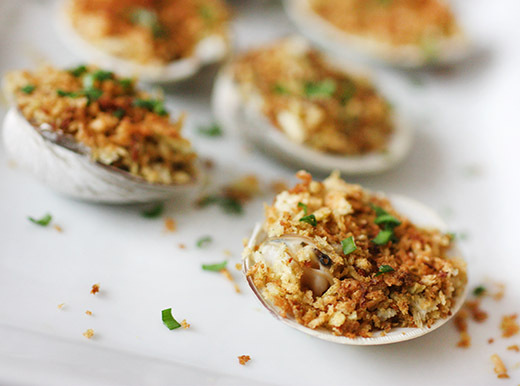 The bread crumb mixture was spooned on top of each opened clam, and the clams were placed on a baking sheet. They went into a 450 degree F oven for 10 minutes and were topped with chopped garlic chives before serving. 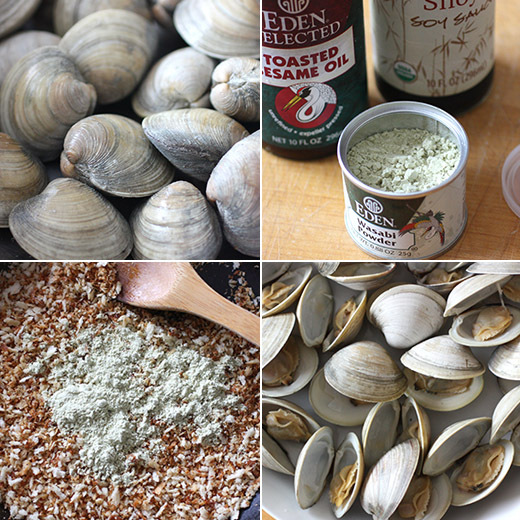 Clams, and all bivalves, are such a good sustainable choice of seafood; I’m thrilled to have some new recipes like this one for using them. There are also recipes in the book for pan-roasted and fried clams. This book does a great job of pointing you in new directions with mostly familiar ingredients and recipes and gets you thinking creatively about myriad other ways you might tweak some of your favorite meals. Happy party season, and Happy Thanksgiving! For a quick virtual vacation to the Yucatan, just open up the book Hartwood by Eric Werner and Mya Henry. As I turned the pages of my review copy, I was brought into the restaurant, Hartwood, and then on into the jungle where many of the ingredients used there are grown. The restaurant was built in 2010 in Tulum and was intentionally left mostly open to the surrounding natural setting. They have solar panels and a gas generator instead of power lines, ice is delivered, and the cooking is done over fire on a grill or in a wood-burning oven. The experience of the restaurant and the food served is very specific to the place despite the challenges that brings. The upkeep of the restaurant is a constant chore due to the heat, humidity, and rain. Werner and Henry clearly didn’t set out to take it easy after moving to the Riviera Maya. But, they did intend to take full advantage of all the local flavors available. The book explains how those flavors are built with roasted oils, pickled vegetables, and the use of wood smoke in the cooking. Lively mixes of fruits and chiles are seen in many dishes, and there are always suggestions for substitutions for ingredients and cooking techniques. I’ve marked the page for the Lentil and Papaya Salad with Lime and Honey Vinaigrette that’s made with summer squash and puffed amaranth seeds. There’s also a Grilled Nopales Salad with Queso Cotija served with a pink hard-boiled egg that was pickled with dried Jamaica flowers. The grilled seafood dishes all look fresh and flavorful like the Maya Prawns with Chipotle Mezcal Sauce served with sliced cucumber, radishes, and mandarin orange segments. There are also vegetable dishes, meat, desserts, and fruity cocktails. My first task was to choose one of the several recipes for ceviche because they all sounded fantastic. 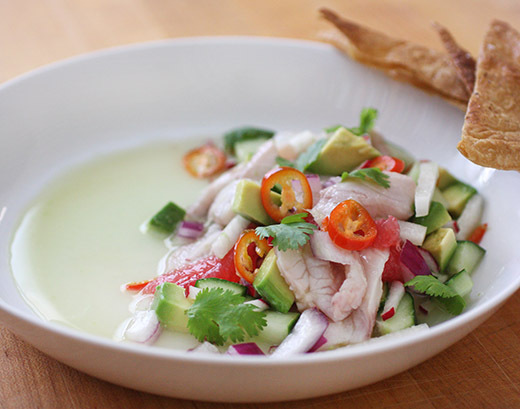 Of course, the most important thing about ceviche is choosing some perfectly fresh fish. In the book, each recipe is specific to a different type of fish, but there are suggestions for other good options depending on what’s available. In the past, I’ve always cut fish for ceviche into small cubes. Here, thin cuts against the grain are advised. The pieces are shaped more like sashimi. I decided to try the recipe called Ceviche de Robalo in the book, and robalo is a fish that moves in and out of fresh and saltwater. I used Gulf-caught black drum instead. My reason for choosing this version of ceviche was the juices, fruits, and vegetables that come together in it. 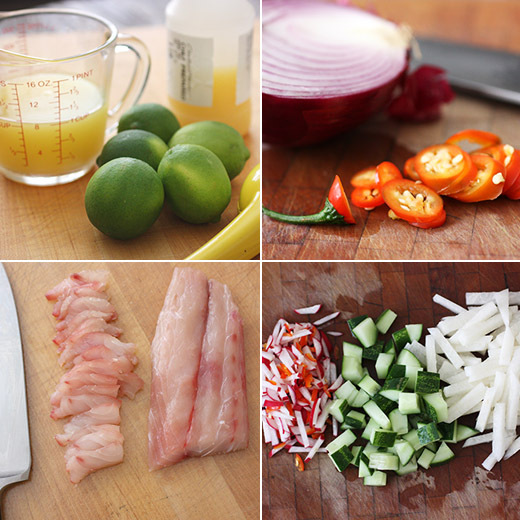 The sliced fish was marinated in orange juice and lime juice with chopped red onion, sliced red serrano, and salt. Meanwhile, a cucumber was juiced by pureeing it in the blender and then straining it. That juice was mixed with coconut water. After the fish had marinated in the refrigerator for 30 minutes to an hour, it was moved with a slotted spoon to a serving dish. The cucumber-coconut water mixture was ladled over the fish. The garnishes were grapefruit segments, thin batons of jicama and radishes, little cubes of cucumber and avocado, and I added cilantro leaves. I can never resist baking some long, thin wedges of tortillas to serve with ceviche. Enjoying this dish was like a mini getaway with the flavors of coconut, serrano, fresh fruits, and crunchy vegetables. 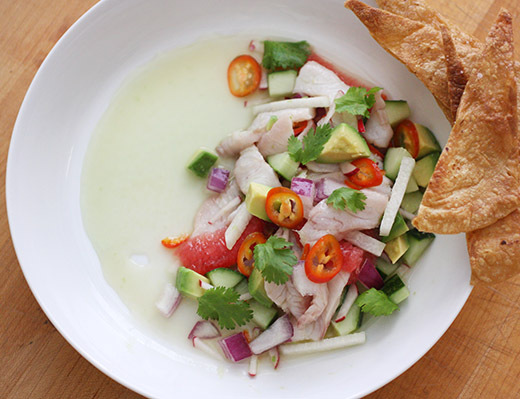 I might always add coconut water to ceviche from now on. Obviously, this restaurant makes the most of the variety of produce available nearby. I’d like nothing more than to visit in person and stroll in after a day on the beach, but until I can get there, I’ll keep virtually traveling with the book. A lot has been written about our industrialized food system, why it needs to be changed, and the damages caused by it. The related environmental and health issues have been exposed repeatedly. But, a new book I just read also highlighted the cultural effects of the current food system. In Decolonize Your Diet by Luz Calvo and Catriona Rueda Esquibel, they describe how “the production of food in the early twenty-first century is wholly alienated not only from the way we live…but from our own cultural histories and traditional food ways.” Their book, of which I received a review copy, encourages a look back at traditional ingredients and ways of preparing meals from Mexican and Central American cuisine. It also focuses on very healthful, plant-based dishes using unrefined, unprocessed ingredients. I couldn’t wait to try a few recipes. The Vampiro Beet and Carrot Salad sounds fresh and pretty with grated vegetables, orange and lime juices, and jalapeno. The Purepecha Bean Soup is made with Flor de Mayo or pinto beans and dried chiles and is topped with crispy corn tortilla strips and diced avocado. As soon as red cabbage shows up in our CSA box, I’ll be making the Sweet Potato Tacos with Red Cabbage Slaw. And, I really want to try making homemade Mesquite Corn Tortillas with a mix of masa and mesquite flour. 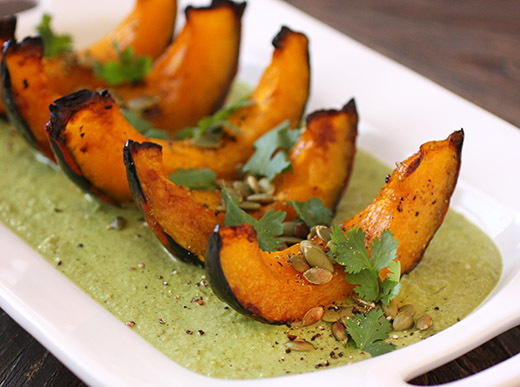 But first, the Kabocha Squash in Pipian Verde dish was calling my name. I sauntered off to our Wednesday farmers’ market hoping to find some sort of small winter squash to use for this without worrying too much about it being a Kabocha. Despite my open-mindedness, I actually found the lovliest, red Kabocha ready and waiting for me that day. This dish was meant to be. There are plenty of ways to start this in advance. Four poblano chiles were roasted, skinned, seeded, and chopped, and those could be prepped and refrigerated until ready to make the sauce. I roasted them directly on top of a burner and turned them as they charred. The squash was cut into wedges and roasted in the oven with a coating of olive oil and sprinkling of salt and pepper. This could be done in advance, and the squash wedges can be reheated when you’re ready to serve. The next step in making the sauce was to broil a quartered white onion, 10 tomatillos with husks removed, a few unpeeled garlic cloves, and I added a couple of serrano chiles. 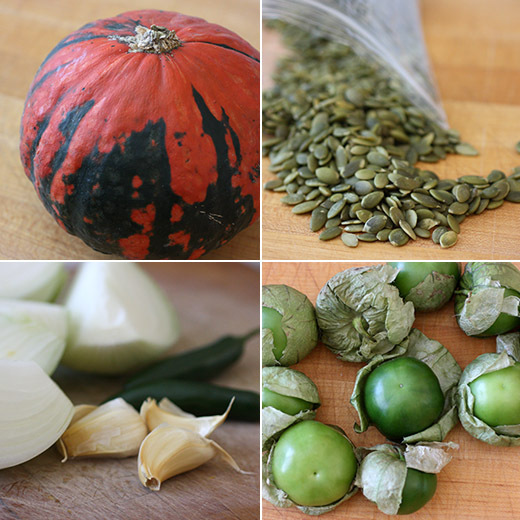 Next, a cup of raw, hulled pumpkin seeds were toasted in a dry pan on top of the stove. Those toasted pepitas along with two cups of water were then pulsed in a blender. Next, the roasted onion, the peeled garlic, the chopped poblanos, my additional serranos, and some oregano, cilantro, epazote, parsley, and a pinch of anise seeds were to be added to the blender. This was way too much for my blender, and I pureed all of this in two batches. Salt was added to taste, and then the purred sauce was transferred to a large saucepan and simmered for about 15 minutes. The simmering really brought the flavors together. 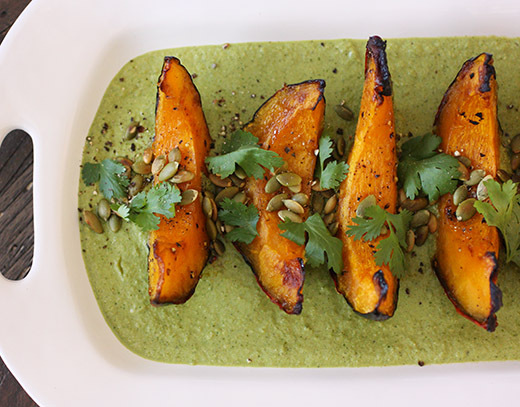 To serve, the roasted squash wedges were set in a pool of sauce and garnished with cilantro leaves and more toasted pepitas. This recipe made a lot of sauce which is a good thing. I’m happy to have some stored in the freezer to use on enchiladas someday soon. And, it was delightfully tangy, spicy, and, herby with the squash. I’d never paired squash with these flavors before, and I’m so glad to have been introduced to the idea. There are several more ideas in the book I’ll be trying too.